Ever tried riding a bike without a front wheel? Supervisors do it every day. Oh, the places you’ll go with two strong wheels! Most supervisors have mastered the technical side of their job. When it comes to navigating the CRM system, they’re experts. Ask about an obscure credit policy and they can rattle it off word for word. Their rear wheel works perfectly. Supervisors who haven’t developed a strong, viable front wheel – the all-important people skills that drive engagement, never get to where they need to go. 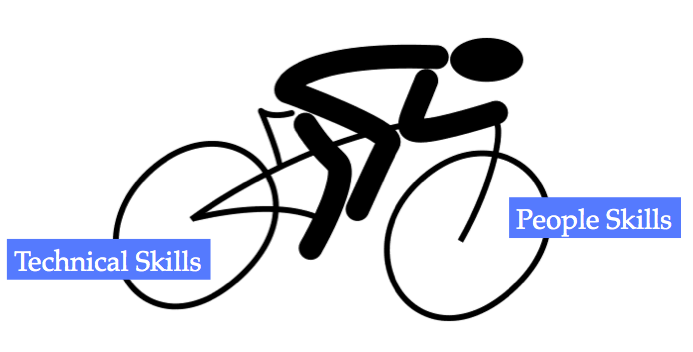 No matter how fast they pedal, if they don’t know how to inspire their reps to do their best and get them fully engaged they lag behind.Few supervisors are born with the right people skills, the rest need front-wheel training. Supervisors with a properly working front wheel and a strong rear wheel get to where they are going faster and with less effort.That said, if a supervisors’ front wheel only needs a tune-up and bit more air in the tire, here are a few tips. Tell your reps what you want and provide them a road map to get there. Never stop reinforcing the message. 3. Ask more than tell. You don’t need to come up with all the solutions, all the time. Your people are an excellent resource on ways to make things better. All you have to do is ask. 4. Control what you can. Let the rest go. Focus on factors within your sphere of control. Make that work and try not to stress about the rest. As Woody Allen said, “80% of success if showing up.” To me, that means advocating for your people and doing the heavy lifting when required. 7. Don’t take yourself too seriously. Being able to laugh at yourself, or the absurdity of a situation, demonstrates maturity. It shows that you can see the big picture.